Leona R. (Wiese) Parde was received by her Lord into heaven on November 16, 2018 at the age of 91. She was born in Beatrice on March 30, 1927 and attended school at Filley. Her Christian faith was nurtured by her loving family. She was baptized, confirmed and married at Zion Lutheran Church of rural Pickrell. Leona married Marvin E. Parde on April 27, 1947. To this union five children were born. Together they farmed near Adams for almost 30 years and then moved to Hickman in 1976. She worked at Telex, an electronics company, until her retirement. 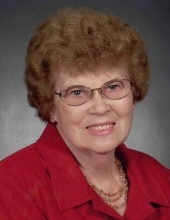 Leona was a charter member of Shepherd of the Hills Lutheran Church. She was an active and faithful member, always willing to serve others. Church activities were many, including hosting Bible studies and friendship groups, making quilts for relief projects, lap quilts for the elderly, and singing in the choir. Life-long priorities included nurturing her Christian faith, caring for her family, accompanying Bev on many ARC trips, gardening, flowers, sewing, traveling and church activities. Her joys in life are now exceeded by her joy in heaven. Survivors include sons, Galen Parde of Filley and Arlan (Cindy) Parde of Adams; daughters, Verla (Arlen) Dorn and Debra (Joe) Thimm all of Beatrice; 14 grandchildren include, Scott (Kim) Parde, Terry Parde, Randy (Lynette) Parde, Lisa (John) Sanders, Michael (Mollie) Parde, Jeff (Angie) Parde, Curtis Riens, Kelsie (Cory) Schroeder, Kim (Tyler) Raasch, Craig Dorn, Angela Kutscher, Michelle (Austin) Toney, Ashley Thimm, and Jarred (fiancée Kate) Thimm; 21 great-grandchildren; sister, Bernice Ideus and husband Butch of Lockport, NY; brother-in-law, Mrl Nelson of Adams; many nieces and nephews; and many extended family members and friends. She was preceded in death by her parents, Frank and Tena (Wolken) Wiese; her husband Marvin Parde (1989); daughter, Beverly Parde; daughter-in-law, Ruth Parde; grandson, Christopher Dorn; great-grandson, Austin Winters; sister, Elaine Nelson; parents-in-law, Evert and Lena (Holz) Parde, Elsine (Parde) Stevens; brothers-in-law/sisters-in-law, John and Tena Parde, Albert and Emma Parde, Bruno and Laverna (Parde) Cyriacks Fitzgerald, Leonard and Arlene Parde. Funeral services will be held at Shepherd of the Hills Lutheran Church of Hickman at 10:30 A.M. on Wednesday, November 21, 2018 with Pastor Ron Drury officiating. Burial will be in the Zion Lutheran Cemetery of rural Pickrell. A family prayer service will be held a 10:15 A.M. on Wednesday at the church. A memorial has been established to the Shepherd of the Hills Lutheran Church of Hickman and Gold Crest Retirement Center in Adams. The body will lie in state at the Fox Funeral Home of Beatrice Tuesday from 8:00 A.M. to 8:00 P.M. and at the church one hour preceding the services on Wednesday. The family will meet and greet friends and other relatives on Tuesday from 6:00 P.M. to 8:00 P.M. at the Fox Funeral Home. www.foxfuneralhome.net Fox Funeral Home of Beatrice in charge of arrangements. To send flowers or a remembrance gift to the family of Leona R. Parde, please visit our Tribute Store. "Email Address" would like to share the life celebration of Leona R. Parde. Click on the "link" to go to share a favorite memory or leave a condolence message for the family.